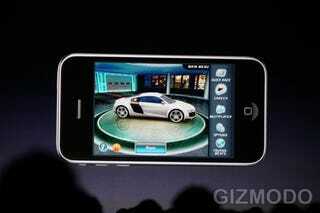 Gameloft took to the stage of Apple's WWDC today to show off the latest iteration of driver Asphalt 5. Gameloft's Mark Hickey announced Asphalt 5, a game that will let you race in 12 locations around the world using 27 licensed cars and four motorcycles. The stereo in the car lets you access directly the music stored on your device. The game will have peer-to-peer multiplayer and DLC, a first for the iPhone. The game will be shipping later this summer. The first content pack will include one car and three new tracks all for 99 cents.